Be the first to share your favorite memory, photo or story of Shanda. This memorial page is dedicated for family, friends and future generations to celebrate the life of their loved one. Shonda N. Calhoun, 48 years old entered into eternal rest suddenly on Saturday, August 18, 2018 at Evans Memorial Hospital. She was born on November 18, 1969 in Newark, NJ to Joe and the late Josephine Nesby. She joined the First African Missionary Baptist Church at a very early age. She was educated in the Glennville and Claxton public schools and graduated from Claxton High School in 1990. Shonda was employed at various jobs within the surrounding areas. Her most recent was at the Target Distribution Center. 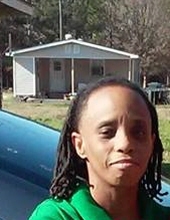 She was a loving mother to two children, KeyShonda and Nautica Calhoun. She was preceded in death by her mother, Josephine B. Nesby. She leaves to cherish her memory her loving and devoted daughters, Airman First Class KeyShonda Calhoun, Dover Air Force Base Dover, DE., and Nautica Calhoun, Glennville, Ga. Her father, Joe Nesby ( Rev. Dr. Vivian Nesby); two brothers, Jeffrey Nesby (Victoria), Glennville, Ga., Joseph Nesby (Marjorie), Orange Park, Fl., one sister, Kava Simmons, Jacksonville, FL. Her grandmother, Mrs. Lola Houser(George), Claxton, Ga. Three aunts, Mrs. Jean Rich, Landover, MD, Mrs. Patricia Reid, Temple Hill, MD, and Mrs. Veronica Miles (James), Cullen, VA. Seven nieces and nephews: DeMadre Nesby, Glennville, Ga., Randall Simmons, Jacksonville, Fl., Austin McCord, Ft. Knox, KY, Zechariah, Jalon, Jordan and Nylah Nesby, Orange Park, FL, and a host of cousins, family and friends. To send flowers or a remembrance gift to the family of Shanda Nesby Calhoun, please visit our Tribute Store. "Email Address" would like to share the life celebration of Shanda Nesby Calhoun. Click on the "link" to go to share a favorite memory or leave a condolence message for the family.